This is a throw WAY back photo, well before ever starting Desk to Dirtbag. 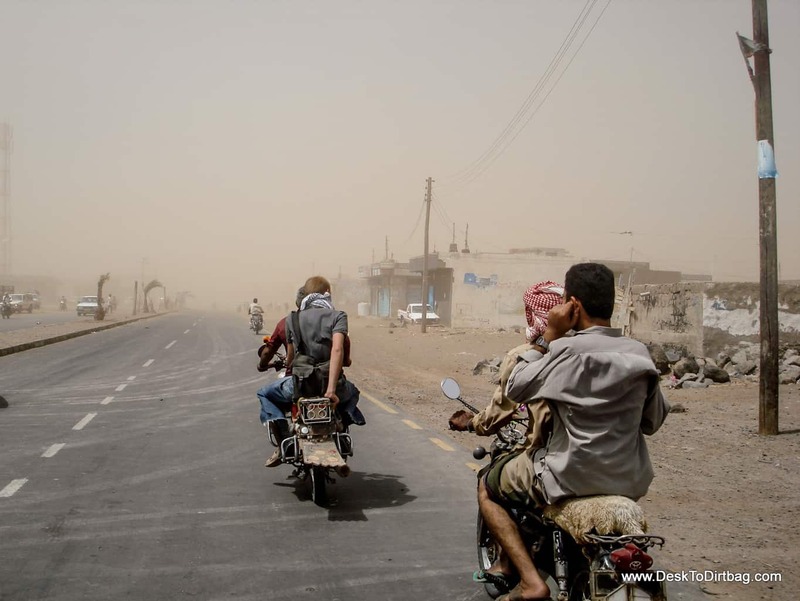 Riding into a sandstorm by motorbike in Mocha, Yemen. I was living in Sana’a, Yemen, the capital, studying the Arabic language, me and my buddy Matt headed out along the Red Sea to get away for the weekend. We hired a few mototaxis to drive us two hours down the beach, through the sand, with waves lapping at the tires, to go to the world’s original coffee port, Mocha (also where the name of the beverage comes from). Only to arrive in the midst of a huge sandstorm… Our drivers dutifully kept on going, just pulling the bottoms of their shirts up over the tops of their heads to keep the sand at bay. Sand got absolutely everywhere. My camera never quite worked again the same after that, either, it would randomly switch modes and the lens would go in and out. After a quick lunch of fresh fish we quickly hightailed it out of there and headed back inland. Still, one of the most amazing memories from an amazing six months in Yemen. I made the below video 7+ years ago (so don’t judge–the song is meant to be a parody!) to tell the tale of our mototaxi journey along the Red Sea. Yemen: The Unknown Arabia by Tim Mackintosh-Smith, a long time expat in Yemen. The Yemenis would ask me if I knew him–you know, all us foreigners must know each other, right? The English Sheik and the Yemeni Gentleman, an insightful documentary about a Yemeni living in the UK that returns and gets to know his motherland with the help of the above mentioned British author.